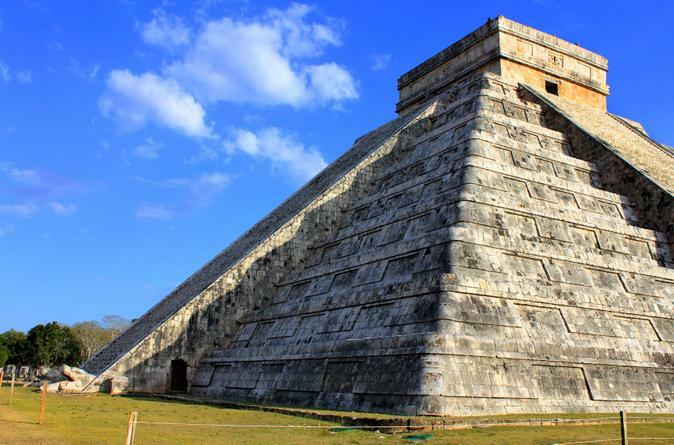 Uncover the mysteries of ancient Mayan civilization on a spectacular full-day tour of Chichen Itza from Playa del Carmen. Sail past long lines as you enter the archeological site through a private entrance with an expert guide. Explore significant structures and gain insight into the captivating history of the Mayans; gaze at sights like the iconic Kukulcan Pyramid as your guide regales you with fascinating stories about the capital of the Mayan empire. Then, venture to the modern and luxurious Mayaland Resort to enjoy a delicious buffet lunch, a refreshing dip in the swimming pool and a relaxing time at Viator's hospitality suite. This is the ideal choice if you're looking for a leisurely, intimate experience of Chichen Itza. This tour gives you more time than others to explore and snap photos of the legendary Mayan ruins. Depart from your Playa del Carmen hotel in a luxurious Mercedes-Benz van and sink into the soft leather of your seat during the scenic journey. Greet your guide at the Mayaland Resort, conveniently located within the archeological park. Sail straight past the crowded visitors entrance and follow your guide to your private admission point. Embark upon a fascinating 2-hour tour of one of the New World Wonders, learning about diverse architectural styles and the cultural significance of the sacred structures. Listen as your guide provides an enthralling explanation of the Mayan’s strong interest in astronomy, directing your attention to the astronomical alignment of the Kukulcan Pyramid’s precise design; each of the 365 steps that lead to the summit of the structure represent a day of the solar year. Admire the intricate serpentine carvings on the structure’s façade then descend into the temple’s subterranean depths to catch a rare glimpse of the vibrant red Throne of the Jaguar, an impressive throne studded with glittering jade stones. Wander through the atmospheric Temple of Warriors to the expansive Ball Court and discover how the mysterious acoustics of the area continue to perplex scientific experts. Peer downwards at the sacred and sacrificial Cenote and find out about the human skeletons and glittering jewelry that were excavated from the site. Next, return to the modern world and visit the luxurious Mayaland Resort to dine upon a traditional Mexican buffet lunch; savor the distinct flavors of Yucatan cuisine during this fulfilling feast. Soak up the sunshine beside the swimming pool before taking a dip in the refreshing waters or heading to Viator's exclusive on-site hospitality suite . Wander amidst the tropic beauty of the botanical garden, awakening your senses to the enticing aromas of flowers and the calls of exotic birds. Relax during the return journey to your Playa del Carmen hotel, where the tour concludes. Be Maya Planetarium Upgrade option:Grasp the opportunity to visit another incredible attract on your way back to Playa del Carmen; upgrade to gain entry to the Be Maya Planetarium and discover intriguing tales od Mayan mythology as you watch the swirling stars in the interactive planetarium.